Secretary Perdue and Karen Pence unveil a honey bee hive at the Vice President’s residence. Steps like this, combined with research, are vital to pollinator health. Pollinators are a vital part of agricultural production. In the United States, more than one-third of all crop production – 90 crops ranging from nuts to berries to flowering vegetables - requires insect pollination. Managed honey bee colonies are our primary pollinators, adding at least $15 billion a year by increasing yields and helping to ensure superior-quality harvests. However, our beekeepers have been steadily losing colonies. The number of honey bee hives in this country has decreased from 6 million in the 1940s to about 2.5 million today. Secretary of Agriculture Sonny Perdue declared June 19-25 as “National Pollinator Week” to help call attention to these losses, which are caused primarily by biological and environmental stressors. Confronting this diverse mix of challenges requires a mix of solutions, and the odds are that we won’t find one magic fix to help our honey bees. 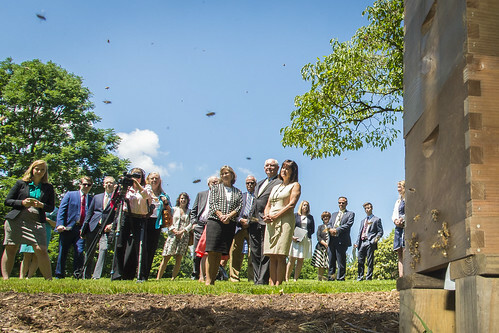 On June 6, Secretary Perdue joined Karen Pence, wife of Vice President Mike Pence, to announce the installation of a honey bee hive on the grounds of the Vice President’s residence in Washington (watch video). They encouraged Americans to also consider setting up hives where possible, or at least to plant bee-friendly flowers and flowering herbs in their gardens and yards. While these are helpful steps that people can take in their own communities, there is also a need for research to better understand this problem and how we can best address it. USDA was one of the co-leaders of a task force that developed a national strategy that laid out a research and management roadmap that we are busily implementing. Our Agricultural Research Service is conducting research to improve the nutritional health of bees, to control the Varroa mite and other pests and pathogens, and to understand the effects of pesticides on colonies. We are setting up long-term studies to determine causes and evaluate treatments for Colony Collapse Disorder and other kinds of bee mortality, and we are establishing a bee gene bank to help breed traits such as resistance to pests or diseases and pollination efficiency. Our National Institute for Food and Agriculture is funding important research at our land-grant universities in this area. For example, University of Nevada researchers have are experimenting with a virus that attacks a bacterial disease that affects honey bees. Meanwhile, Michigan State University scientists are developing sustainable pollination strategies such as enhancing the effect of bee-friendly wildflowers. Our National Agricultural Statistics Service, working with the Animal and Plant Health Inspection Service have begun taking a nationwide survey of bee health that sets baseline values for pest and disease prevalence. The U.S. Forest Service and the Farm Service Agency has been creating and restoring hundreds of thousands of acres of pollinator habitat, while the Natural Resources Conservation Service has provided financial assistance to landowners to protect or restore 30,000 acres of private lands. Honey bees may be some of the hardest workers you’ll ever see, but they need our help. At USDA, we are making sure that they get it. We should be able to implement a program that involves more awareness of this issue. Therefore, it would increase awareness and participation. I myself, am in the process of doing just that; becoming a participant just from watching the movie "Migration of the Butterfly"
Does the USDA team up with DOD to allow beekeepers to install hives on DOD installations? Keeping bees in your own backyard is one of the best ways to help our pollinators. A sustainable beekeeping company is the way to go. One, called Beepods, even collects data from the hives it sells to help research Colony Collapse Disorder! It's all very well unveiling bee hives, but until farmers stop spraying with glyphosate, bees will just keep dying. I think Bees are one of the most important resources we have, without them we could not thrive vegetative wise. I don't think. Love Bees in their rightful place. Are honey bees protected? I live in a rural neighborhood which had a honey bee hive in one of our neighbor's trees. Some of the neighborhood children are highly allergic to bees so she (our neighbor) has been working with the city to get someone to safely relocate the hive. This has been going on for about two months without much success. Sadly tonight, on a dare, a drunken neighborhood man knocked a large portion of the hive from the tree, leaving the drones and honeycomb on the ground. Our city police and fire have no suggestions how to handle the downed bees and honeycomb and I fear that other persons may decide to knock the rest of the hive down. Please let me know if you have any suggestions. Patti Martinez, Placentia, Orange County, California. @Patricia Martinez - The short answer to your question is that honey bees are not protected. You may be able to obtain assistance from a local beekeeping club to capture the colony in a hive box to save it. Please contact the California Beekeepers Association’s contact listed for Orange County. You can find that contact here: www.californiastatebeekeepers.com/affiliated-clubs. You can also contact the California Department of Food and Agriculture State Apiary Board for possible assistance. Reach out to Courtney Albrecht, Specialist, California Department of Food and Agriculture, California State Apiary Board in Sacramento: courtney.albrecht@cdfa.ca.gov. The State Apiary Board website is here: www.cdfa.ca.gov/plant/pollinators/apiaryboard.html. I am a small sideliner beekeeper in Northfield Ma. At the present time I have 14 hives . I am looking to expand. I do have a big concern with this very cold weather I might loss all my hives. If this happens it will really set me back. Could you let me know if there are any corporations or departments with in the USDA that is willing to support the building of a medium size apiary? This would be a dream come true. I feel sorry for the poor bees they are mainly affected by global warming. Another thing I am sorry for is how some people are so selfish that all they do is spent the country's money on weapons that have no effect on other countries. Come on people why weapons and not stuff that makes good, like better scientific research that can help save the population of the bees and other animals. If a magical genie popped out of a teapot thing and gave me 3 wishes, I would wish for world peace, a better leader, and my last wish would be for the bees, I would make it so people would, well farmers would use a more bee-friendly, and or nothing at all to "help protect the crops." I am looking to plant 40 acres of Wild flowers to help restore the bee population. New to beekeeping we rehomed into a hive boxe with the help of a professional beekeeper (who is also a halo-flight paramedic) an Africanized hive on my very remote South Texas ranch. One hive down and 4 to go. It was an experience of a lifetime and not for the faint of heart. And yes you can get stung through a bee suit. I have to say the honey from Mesquite and Guajillo trees around is the most amazing honey ever.